Almost 9,000 firefighters and support personnel are trying to put out fires burning across more than 250,000 acres of land in Washington and Oregon. 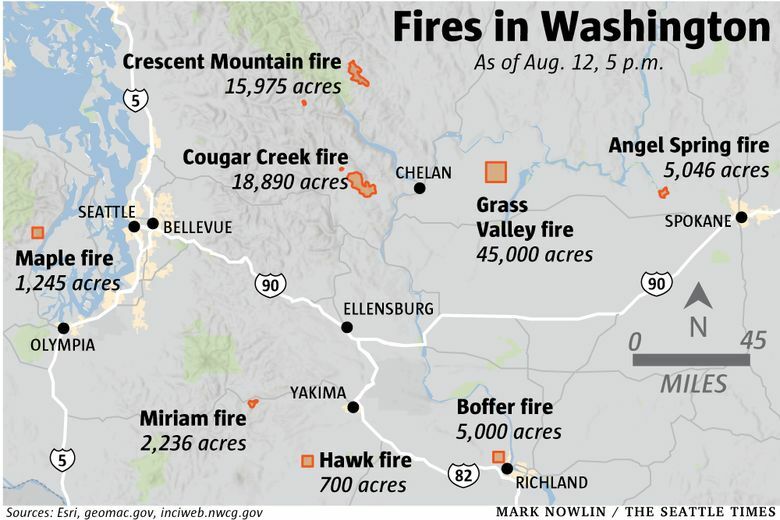 Lightning strikes over the weekend sparked dozens of Washington state wildfires. Strong winds spread new and existing ones, even as the cooler, wetter weather provided temporary aid to fire crews in some areas. There are two dozen large fires in Washington and Oregon involving 256,451 acres, the Northwest Interagency Coordination Center (NWCC) said Sunday morning. More than 8,580 people, including firefighters and support personnel, are assigned to fight the blazes. Washington recorded more than 180 lightning strikes over the 24 hours that ended at 8 a.m. Sunday, as thunderstorms rolled across the Northwest. Strong winds fanned flames across an already dry landscape. In some areas west of the Cascade Mountains, rain, cooler temperatures and increased humidity provided temporary aid to firefighting efforts. The near-term weather forecast calls for more thunderstorms and associated elevated fire risk in Eastern Washington on Wednesday afternoon and Thursday. For most of Washington and Oregon, fire danger is “well above average for this time of year,” NWCC said. Grass Valley: The fire is burning across 45,000 acres west of Grand Coulee Dam, Grant County. It’s zero percent contained, and involves 100 firefighters and support personnel. 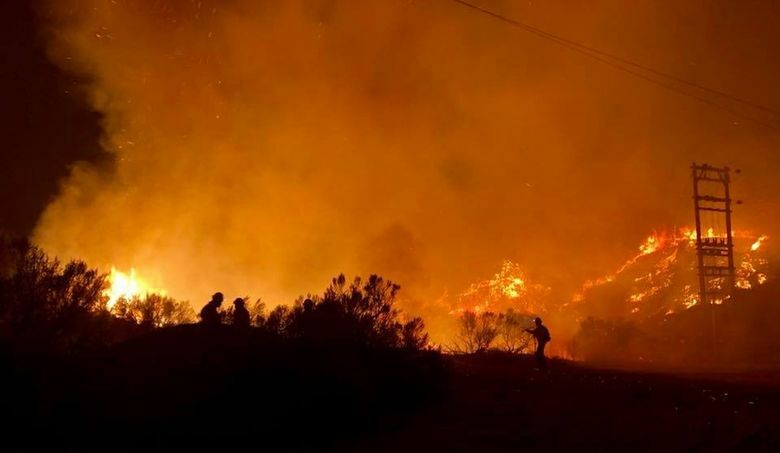 The fire was reported late Saturday morning and quickly grew as a wind-driven flame wall stretched as far as 12 miles across the hot, dry grasslands. Firefighters focused on defending buildings in the fire’s path. One firefighter was injured and taken to Harborview Medical Center. There are an estimated 150 homes adjacent to the active fire area. Evacuation orders remained in effect Sunday for parts of Grand Coulee, Electric City and Coulee Dam. Cougar Creek: The fire is burning across 25,695 acres near Chelan, Chelan County. It’s 5 percent contained, and involves 1,190 firefighters and support personnel. Caused by lightning on July 28, the fire is demonstrating “extreme behavior,” burning uphill in timber lands and threatening structures, according to NWCC. Residents near the town of Ardenvoir along Mad River and Entiat River roads have been ordered to evacuate. Others in the area were told to prepare to evacuate. Crescent Mountain: The fire is burning across 15,975 acres near Winthrop, Okanogan County. It’s 12 percent contained, and involves 594 firefighters and support personnel. The fire was sparked by lightning about 21 miles west of Twisp on July 29. As of Sunday morning, it was 13 miles from the town and 1.7 miles from the closest structure. Residents in the area of Twisp River Road are advised to be ready to leave should authorities call for an immediate evacuation. The fire is predicted to move east, presenting a heightened chance of evacuations. 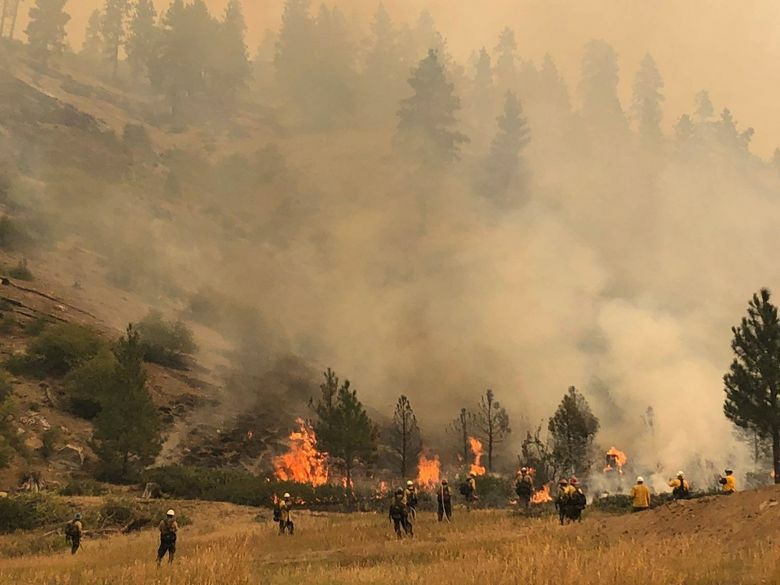 At least 20 new fires, ranging from less than an acre to more than 20 acres, were sparked by lightning in the Methow Valley Ranger District. One fire was 3 miles as the crow flies from the town of Mazama. Smokejumpers, air tankers and other firefighting crews were responding to these new flare-ups. Miriam: The fire is burning across 2,236 acres 2 miles east of White Pass Ski Area in the Goat Rocks Wilderness. It’s 9 percent contained, and involves 354 firefighters and support personnel. Firefighters continued to focus on protecting structures at the ski area and search for areas to fight the fire along the rugged east flank of the wilderness area. Sheep Creek: The fire is burning across 458 acres northwest of Northport, Stevens County. It’s 70 percent contained, and involves 320 firefighters and support personnel. Fire spotters detected two new fires nearby on Saturday. One, the West Hubbard fire, was 10 to 15 acres in size on Sunday. Another, the Horns fire, has grown to at least 200 acres. Fire crews were trying to gain access to the fires Sunday.